Lifestyle home theater systems are often painted with the same brush; for those keeping score, that’s not a compliment. Small 5.1 surround packages – especially powered HTiBs (Home Theater in a Box…should be a coffin) that offer a Blu-ray player , receiver and cables in one package – tend to promise a lot but generally fall flat when it comes to sonic performance. Smaller, inexpensive systems are capable of offering excellent sound quality as evidenced by the Pioneer SP-PK52FS system that we reviewed last week, but that tends to be the exception the rule. So what happens when a company like KEF decides to let their award-winning Uni-Q driver technology found on their flagship Blade, LS50, and X300A loudspeakers trickle down to the bottom? The E-series E305 5.1 surround system. KEF couldn’t wait to let the cat of the bag on this new lifestyle home theater system; and given how impressive it looks on paper, we think we can understand. The E305 system is a rather stark departure from the excellent KEF T100 5.1 system that we just reviewed because of its use of KEF’s proprietary Uni-Q driver technology which combines a woofer/tweeter in one driver. 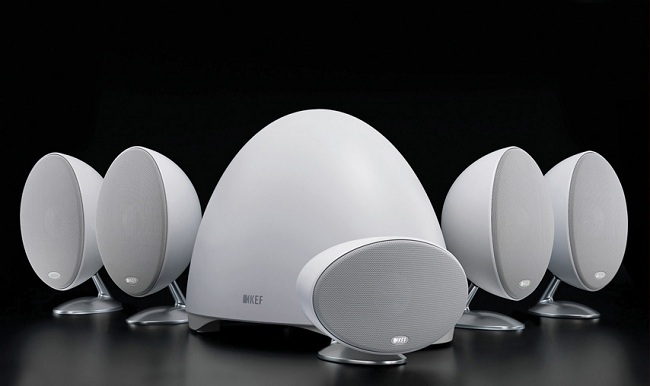 The E305 satellites do not use the same driver found in the more expensive X300A or LS50s but a smaller one consisting of a 4.25-inch midrange/low frequency driver, and a .75-inch vented aluminium dome tweeter. The tweeter at the center of the midrange cone is vented to help prevent distortion-inducing pressure from building up behind the dome. The idea is to keep the speaker’s response in the critical vocal region as intricately detailed as possible. KEF’s ‘tangerine’ waveguide is meant to encourage sound to radiate evenly, increasing both the dispersion and sensitivity of the tweeter for a more natural performance throughout the listening area. The Uni-Q driver is one of the most coherent sounding transducers we’ve ever heard (the LS50s are my reference loudspeakers at home) with incredibly high levels of resolution, detailed and airy highs, and potent bass response for such a small driver. The E301 satellites measure 10.2 x 5.5 x 6.3 (HxWxD – in inches) and weigh 5.3 pounds a piece. Finished in either silky matte black or white, the metal enclosures are heavily braced to reduce unwanted resonances and sound coloration. The supplied metal base provides for a stable platform if you want to set this system up on a media unit or bookshelves. As an accessory, KEF also offers a stand for the E301 satellites that places the center of the tweeter 33.4-inches from the floor. The E301s are are rated at 86dB in 8 ohms with a quoted frequency response of 90Hz – 33kHz +/-3dB. If they measure anywhere near the LS50s, it is safe to say that their sensitivity rating is likely to be in the 84-86dB range, with the impedance dropping to 3 ohms as you cross over into the upper midrange and lower treble. An AV receiver that can output at least 100 robust watts into a 4 ohm load will be a good match for this system. The E-2 sealed powered subwoofer utilizes a downward firing 8-inch low-frequency driver to handle all of the bass where the satellites roll-off. The subwoofer features a 250 watt/channel Class D amplifier and its quoted frequency response is 33Hz – 280Hz. Weighing 17 pounds and measuring 12 x 17 x 10 (HxWxD – in inches) the subwoofer would appear to offer the sort of robust build quality rarely seen in a 5.1 speaker package.